There's some things I just don't talk about on this blog. Sometimes I feel like my whole world is out there for all to see, but I actually do keep a lot to myself. Bloggers, I think, need to draw a line somewhere because you never know who is reading. Plus, we shape peoples' perception of who we are. Putting it all out there isn't something I tend to do with this space. In fact, sometimes I don't know what to write about because my thoughts aren't necessarily what I feel like putting on the internet. This is kind of an example of that. Last year, my aunt passed away at a relatively young age. 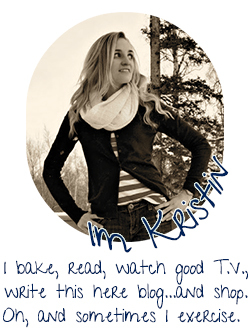 She was the first person to ever comment on this blog and she read it regularly. She gave me this chili recipe when I got married because I was marrying into the military and, given her own experience, you needed to be able to cook for large groups of people. With the recipe, came a giant stockpot, which she'd picked up in Spain. 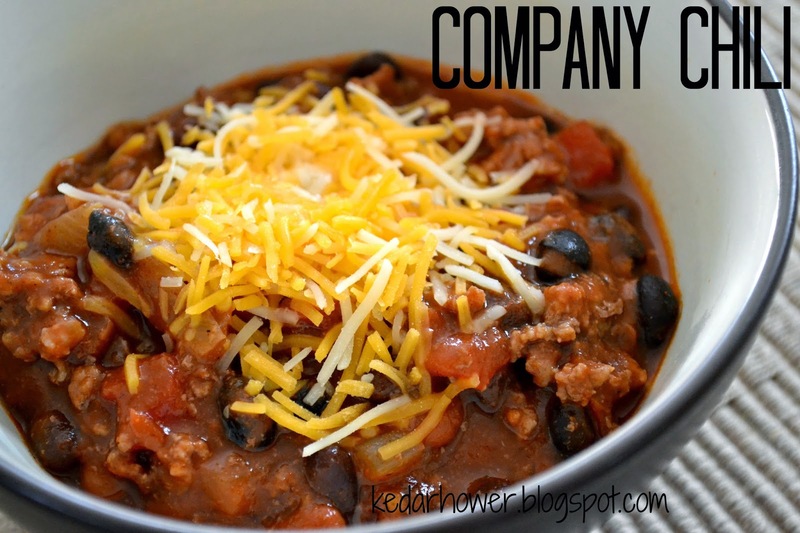 It's called Company Chili because the blue stockpot (when full) would definitely make enough for an entire army company. I've made chili with my aunt's secret ingredients several times and it never disappoints. Scott loves it. Last summer, my friend needed a recipe for a chili cook-off and I gave her this one. Now, I don't know how many people were in this contest, but she did win Best American Chili, so it has to be kind of good, right? My favorite way to eat it is baked in the oven with a spread of cream cheese and cheddar over the top, a la chili cheese dip. I also freeze servings of it in Ziploc bags for busy days. It'd be perfect for a get-together, including any upcoming Superbowl parties. The more I think about it, the reason I'm sharing this now is because I don't want you to not know about it. Does that make sense? I'm sharing this specifically because I want you to have my chili recipe. Brown the meat in a pan with some olive oil and drain any excess fat. Over medium heat, add in the pepper and onion and cover for 5-10 minutes. Stir and add the beans, chili seasoning, diced tomatoes, tomato sauce/paste, smoked paprika, and nutmeg. Let it simmer together for about an hour. At this point, if you want your chili to be thinner, add some of the broth (I always end up with a different consistency). A few minutes before serving, stir in the chocolate chips and let them melt. Serve with sour cream, cheese, tortilla chips, etc. A good chili recipe is worth sharing. Maybe I should make that for dinner tonight! I like the story behind this...thanks for sharing. Also, cream cheese and cheddar baked over it? Genius! I like stories behind recipes. This is a good one. I definitely feel you on some days what I put out is not exactly what I feel. 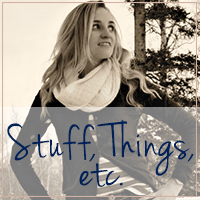 I don't think everything should be on a blog. I've seen some people (small and big bloggers) put things out there and I'm just going that really does NOT need to be on the Internet...put it in a journal. I'm all for vulnerability, but no matter what I choose what you see. So sorry for the loss of your aunt! But it's so neat that you have this recipe to remember her by! Thanks for sharing, this looks delicious! I have seriously never heard of putting chocolate chips into chili, and it's JUST crazy enough that it MUST be good! I'm so sorry to hear about your aunt, and I'm really happy that you chose to share this story (and recipe) with us. It will definitely be something I try. I used to use Bush's Chilistarter for my chili. I can't find it in California though. It's so weird. The commissary carried it in Japan, but I can't find it here. It sounds good though! I love that there are chocolate chips in this recipe. I always add some cocoa powder to mine, basically the same difference, but not a lot of people do it and I think it makes a big difference! aww what a lovely story - and I'm sorry to hear about your aunt. I'm not a huge fan of chili, but if I was ever to make it.. I'd obviously make the one that won Best American Chili! I love this story and the recipe sounds delicious!! What a sweet story!! And this chili. Fantastic!